› Author Affiliations Funding This project was funded by the Agency for Healthcare Research and Quality (K01 HS021531; PI: Ancker). Background and Objective Patient-generated health data (PGHD) may help providers monitor patient status between clinical visits. Our objective was to describe our medical center's early experience with an electronic flowsheet allowing patients to upload self-monitored blood glucose to their provider's electronic health record (EHR). Methods An academic multispecialty practice enabled the portal-linked PGHD tool in 2012. 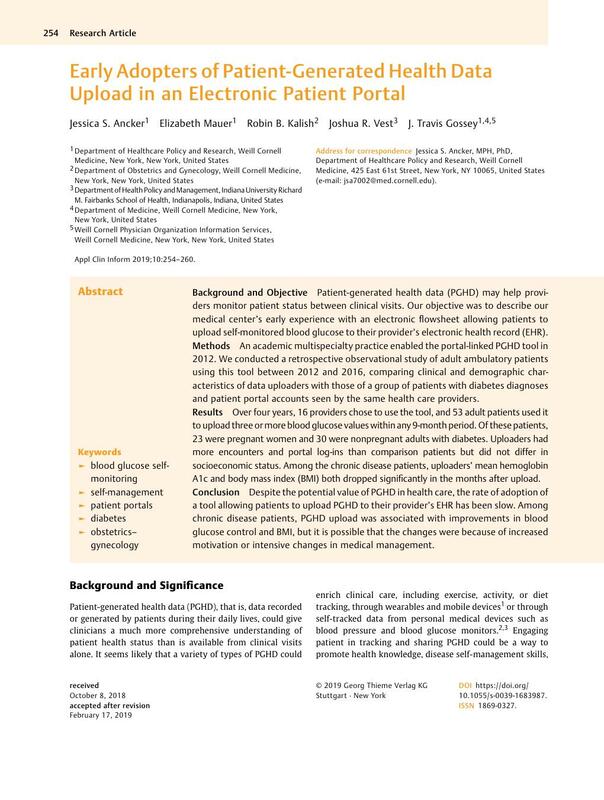 We conducted a retrospective observational study of adult ambulatory patients using this tool between 2012 and 2016, comparing clinical and demographic characteristics of data uploaders with those of a group of patients with diabetes diagnoses and patient portal accounts seen by the same health care providers. Results Over four years, 16 providers chose to use the tool, and 53 adult patients used it to upload three or more blood glucose values within any 9-month period. Of these patients, 23 were pregnant women and 30 were nonpregnant adults with diabetes. Uploaders had more encounters and portal log-ins than comparison patients but did not differ in socioeconomic status. Among the chronic disease patients, uploaders' mean hemoglobin A1c and body mass index (BMI) both dropped significantly in the months after upload. Conclusion Despite the potential value of PGHD in health care, the rate of adoption of a tool allowing patients to upload PGHD to their provider's EHR has been slow. Among chronic disease patients, PGHD upload was associated with improvements in blood glucose control and BMI, but it is possible that the changes were because of increased motivation or intensive changes in medical management. This study was approved by the Weill Cornell Institutional Review Board with a waiver of consent for use of de-identified data.